I am delighted to announce a very important recent acquisition, in fact, one of the most significant additions to our collections in recent years. The collection, which will be known as the European Manuscripts Collection, consists of 143 items, including some printed items, an exquisite seventeenth century Italian manuscript prayer book, and the centrepiece of the collection, a stunning fifteenth century Book of Hours. MS 45: Italy (probably Naples), circa 1460. 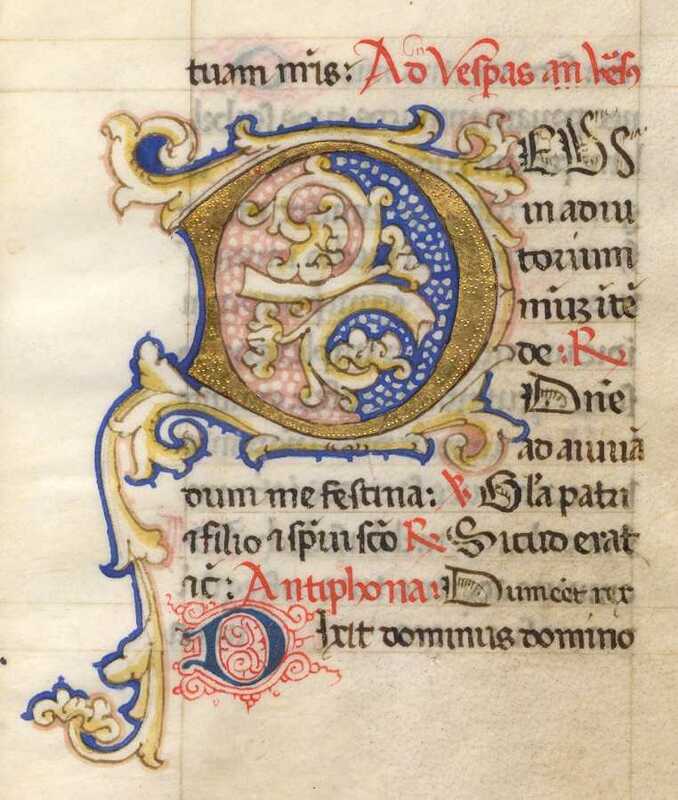 From a breviary showing Vespers from the Hours of the Virgin. An example of gold tooling. Most of the items are illuminated manuscript leaves, and come from a range of different types of manuscript, including Books of Hours, missals, breviaries, graduals, psalters and a papal bull from Perugia, dated 1265. The material dates from the twelfth to the seventeenth century; the items are predominately of French origin (about half of the collection), with about a quarter originating from Italy and others from England, Spain, Germany, Belgium and the Netherlands. MS 85: France (Valenciennes), circa 1480. 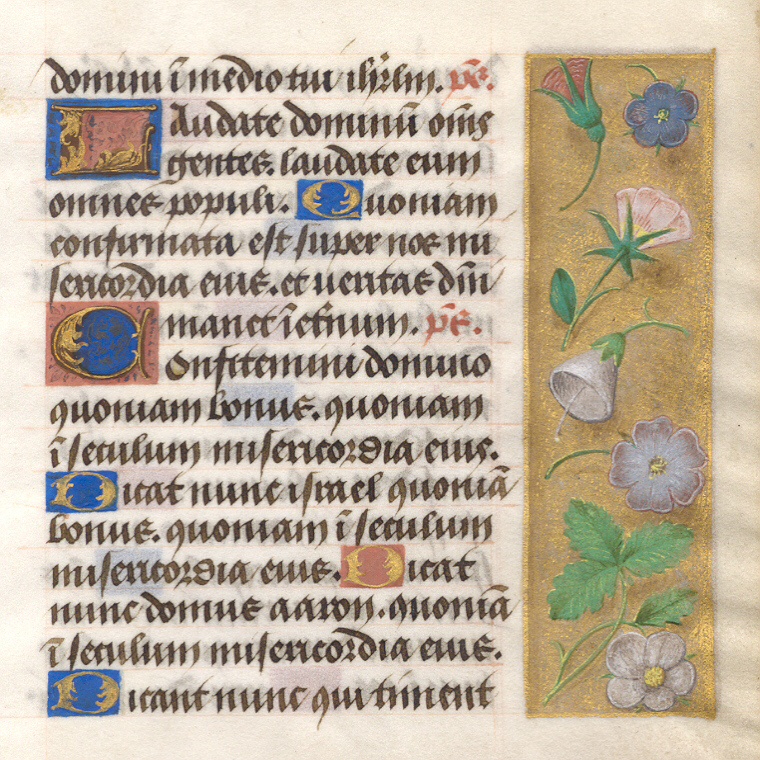 From a Book of Hours showing parts of Psalms 115, 116 and 117. It is thought that the border is the work of the illuminator Simon Marmion or one of his circle. Marmion was described as “the prince of illuminators” by a near contemporary. The Book of Hours [see image below] was produced in the latter part of the fifteenth century, and was written in Latin and French in two stages in Southern Burgundy (or near Lyons) in France. The manuscript has several interesting features which may hint at the identity of the original owner, including the unusual prominence of St Humbert (there is a full page miniature of the saint), suggesting that the original owner had the name ‘Humbert’. MS 43 (Book of Hours): Folio 25 recto – Hours of the Holy Spirit – Matins. A miniature showing the Virgin Mary and Apostles and the Holy Spirit (Pentecost). The collection has been very generously donated to us through The Art Fund. The donors, who wish to remain anonymous, chose the University as a home for their collection as one of them is a Reading graduate. They knew that we already held a Book of Hours in our collections, and thought that it would be good to develop and expand Reading’s medieval holdings, particularly for the benefit of the Graduate Centre for Medieval Studies (GCMS). We are fortunate to have a few early manuscripts in our collections, notably a fifteenth century Book of Hours, but this new acquisition will completely transform our holdings in this area and open up a wealth of teaching, research and other opportunities for the University, and provide an extensive resource for academics and students, especially in the GCMS, and in the History and Typography departments. We are planning a number of events and other initiatives to publicise the collection, including an exhibition in the Special Collections Service staircase hall in 2019. As a launch event for the collection, we are planning a pop-up display as part of the MERL’s extended hours late opening night on the last Thursday of November this year. We were very pleased to give delegates from this year’s Fifteenth Century Conference, which was held in Reading, a sneak preview of the collection last week, and hope that they will also help us to spread the word about this new acquisition. Detail of MS 89: France (Picardy, possibly Amiens), circa 1300. 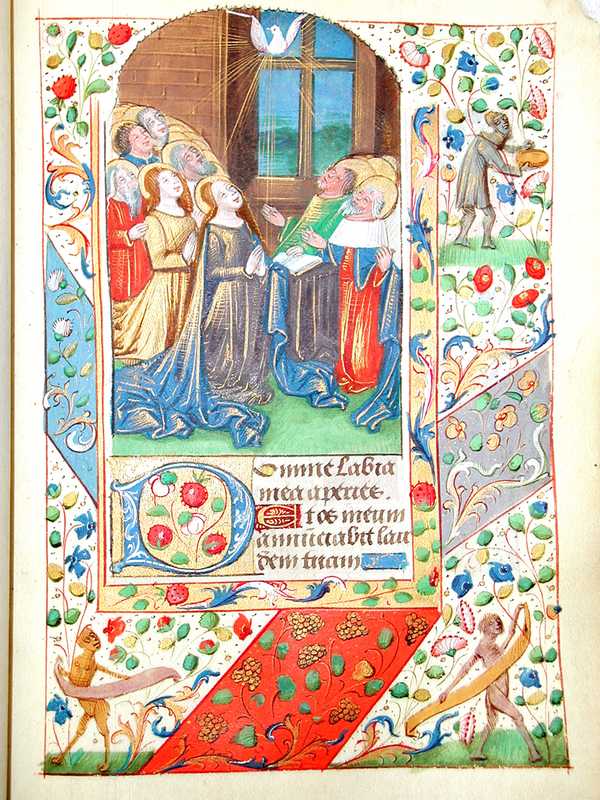 From a Book of Hours and is partly from Psalm 144, and partly from Luke. 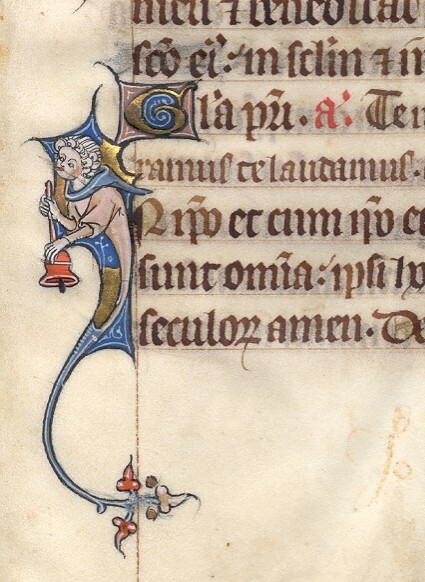 This detail shows a drollery with curly hair, holding a red bell. We will be starting to catalogue the items onto our online catalogue soon. In the meantime, a handlist and a series of CDs produced by the donors, with a catalogue and images of the manuscripts, are available to help readers access the items. Please contact Caroline Gould (Principal Archivist) or Fiona Melhuish (UMASCS Librarian) via the Special Collections Service for advice on accessing the collection. Detail of MS 90: France (Paris), circa 1330. From the St. Albans Abbey Bible showing 1-Chronicles 12:40 to 16:5. This entry was posted in Collection News, Events & Announcements and tagged illuminated manuscripts. Bookmark the permalink.